KoopaTV: Trump Transition Team Considering Reggie Fils-Aime?! A source whose job it is to watch the C-Span press area pool feed of the Trump Tower elevators reported that someone who looked like Mr. Fils-Aime went up to the president-elect's office suite sometime Monday afternoon. This comes amidst controversies surrounding both the president-elect and Mr. Fils-Aime. For Mr. Trump, questions have risen regarding the diversity of his cabinet, and the presence of dangerous “alt-right” elements at the highest levels of government. All across America's cities, protestors continue to contest the results of the election and chant that Mr. Trump does not represent them. For Mr. Fils-Aime, he is seen as the central figure preventing the cult classic MOTHER 3 from being localised for the North American audience. Protestors regularly sit outside of Nintendo of America, demanding its release, only to be forcibly removed by the Reggie Fils-A-Mech security system. 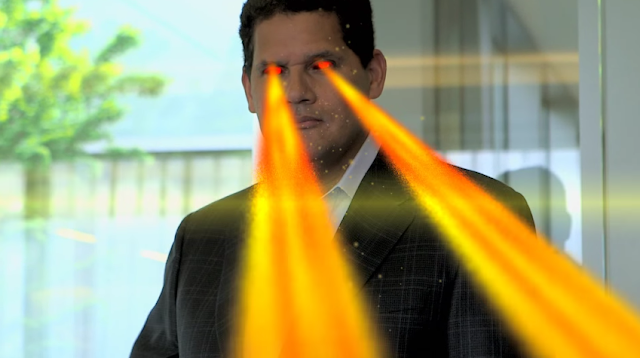 File image of the Reggie Fils-A-Mech clearing MOTHER 3 protestors from the Nintendo of America premises. Mr. Fils-Aime, if selected for any position, would have to resign from Nintendo of America, and would have to disclose any potential financial conflicts of interest, a reversal of Mr. Fils-Aime's usually private personal life outside of his work at running Nintendo “16 hours a day.” Mr. Fils-Aime completed a Bachelor of Arts in applied economics and management at Cornell University in 1983, with strong performances in reviving Derby Cycle and VH1, before coming to Nintendo in 2003. He became president and chief operating officer of Nintendo of America in 2006. KoopaTV reached out to both the Trump transition team and to Nintendo of America for comments, but neither organisation has responded. Ludwig is a reporter at KoopaTV. Stay tuned to KoopaTV for any more developments of this and other stories. Mr. Fils-Aime previously canceled a lunch meeting with President Barack Hussein Obama. Believe it or not, Ludwig wrote this whole article (it's a parody) to use as an in-house example piece for KoopaTV's next article, a guide to how to be a good media consumer. Those protestors have succeeded! MOTHER 3, come to me! Reggie Fils-Aime is actually retiring from Nintendo while the Trump administration is in power. Ah, your sources. Of course! I know to depend on KoopaTV for all my investigative reporting needs! Maybe you can look into the exploding Samsung Galaxy S7s and inform us all on how the recent iPhone 6S battery issues, that Apple has recently acknowledged, are actually evidence of a plot from battery manufacturers in China to... erm... disable all our smartphones, or something. I'll leave that part up to you and your sources. Oh, and how would this relate to video games? Super Mario Run will be on Apple devices. 'Nuff said. The truth does not care about whether or not it's related to gaming! The key to a good source is that they give you just the facts, and leave the analysis to us. And clearly, we have the best analysis anywhere. You seem to be references Burger vs Pizza far more often than other Splatfests. Who knew that food can impact you far more than other topics. Reggie is in his prime! Just when I thought he could only go downhill from here, he surprises me with another unforeseen twist. Whatever position Reggie fills, I know that he will not only make America great again but the entire video game industry as well.